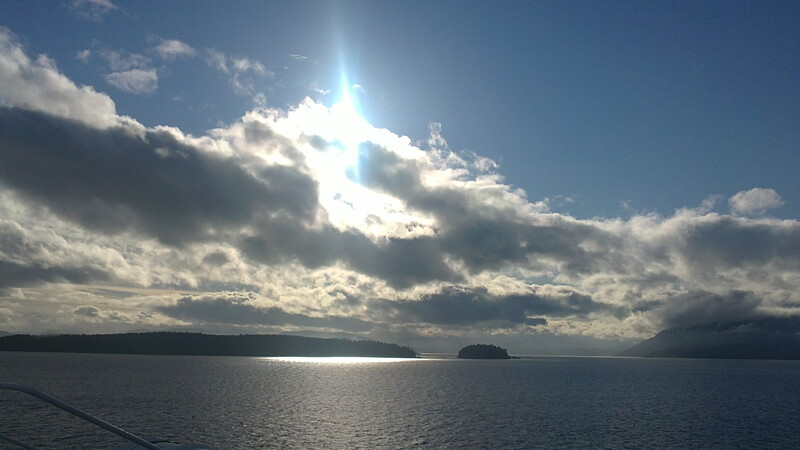 On a recent trip to Vancouver Island I took a ferry from the mainland which sailed through the south gulf islands. 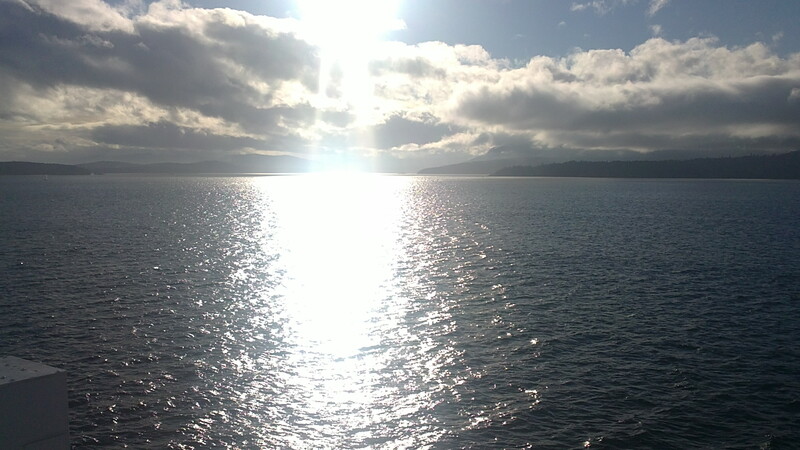 Truly one of the most beautiful ferry trips I’ve been on. 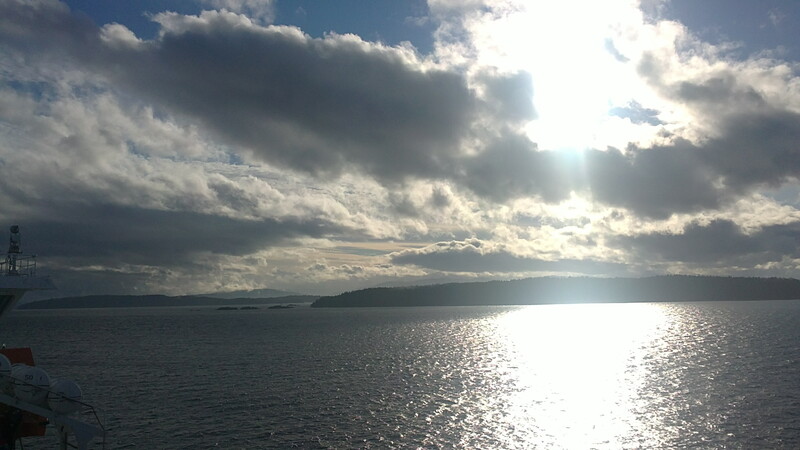 It was a beautiful day with remarkable low lying clouds hanging over the small islands and as i watched from the upper deck i started to notice how interconnected the whole scene was. The interaction was palpable and what seemed like separate things in the sea, the boat, the sky, the sun, the clouds, the land and the trees slowly started to reveal a hidden relationship. See the pictures below. The clouds hanging over the islands completely confused my analytical mind. How was it that clouds could be so low and not moving, just parked on top of the small islands. Why weren’t they moving? There was definitely wind blowing across the boat, so that made no sense. For the first half an hour i couldn’t work it out then suddenly it just revealed itself. The trees were holding the clouds to the land. What was missing to the eye was the water vapour that stretched like an invisible fog in all directions and bridged the gap from the sea to the clouds. It’s what we never see unless it gets so dense it becomes clouds, fog or mist but it’s always there in dynamic relationship to the sea and the sky. It’s a huge part of the atmosphere and it’s composed of water. Water in the sea, in the vapour, in the clouds and in the trees in a tensile relationship. The scene suddenly looked like the trees didn’t want to let go of the clouds and maybe the clouds didn’t want to move away from the islands, so they morphed to the shape of the island and sat there almost on the treetops as I passed by on the ferry. Clearly the wind wasn’t strong enough to break the linkage nor was the sun’s rays strong enough to disperse the clouds, so there was a balanced membranous tension that was all about water and its property to attract other water molecules, and I realized that the only way I’d worked it out was to shift away from what I was seeing and feel the scenery through my body and its fluids. And now when I consciously dropped into the fluid volume of my body it totally made sense. The depth of the sea and its dynamic connection with me and all water forms around it, and then the clouds felt like they were an extension of my fluid volume, more like whispy organs than separate objects. The trees were like me, no different, structures with water in the them and now I felt the sunshine pouring through the vapour field into me and scintillating my fluids, exciting the water molecules in my body. Then, for a while, I don’t know how long, I lost my sense of separateness and the interactions became so beguiling and the water molecules almost hummed in constant motion and vibration, and from second to second everything was feeling its way with everything else and that is what we call movement but all it seemed like was a shifting of millions of water molecules finding balanced tensions and maintaining it by altering their positions. The surface of the sea was like a cell membrane with water entering and leaving the body of the ocean constantly and the clouds were doing the same in a huge endless field of vapour. And the sea and the clouds were dense versions of the vapour and the trees were taking in and giving out water too and so was my body, it was an exchange constantly taking place between everything and that’s how we relate. We are in constant flux with our environment, each other and water is the currency. We feel through water. We sense through water. I’ve no idea how we do that but it’s extraordinary.